Hicollector is one of Hawaii’s few collectible dealers in the Aloha State. We started in 2001 as Illusions glassworks and supplied on a consignment basis glass collectibles to store in Oahu. Like all businesses, our company was affected by the economic crisis. In order for our company to survive, we diversified our products and changed our name to hicollector. With the revised name and products we relaunched our services and included direct sales and marketing to customers. No longer just a middleman, our products are now sold thru direct sales at the different shows, swap meets and flea markets. As of 2016, we have begun the launching of our storefront location. If successful, we will be expanding to kiosks throughout the entire state of Hawaii. One of the things we want to do at Hicollector is to give collectors the benefit of being able to find their niche product. We are passionate about helping collectors as we know that searching for that particular item can be both frustrating and tiresome. This is why we welcome all collectors to contact us and send us a request. Chances are we can find that item you are looking for saving you both time and money. In 2016 we opened our first store location. Located in the Dillingham Trade Center on the third floor, this brick and mortar store is filled with a huge amount of different collectibles from a variety of different genres. 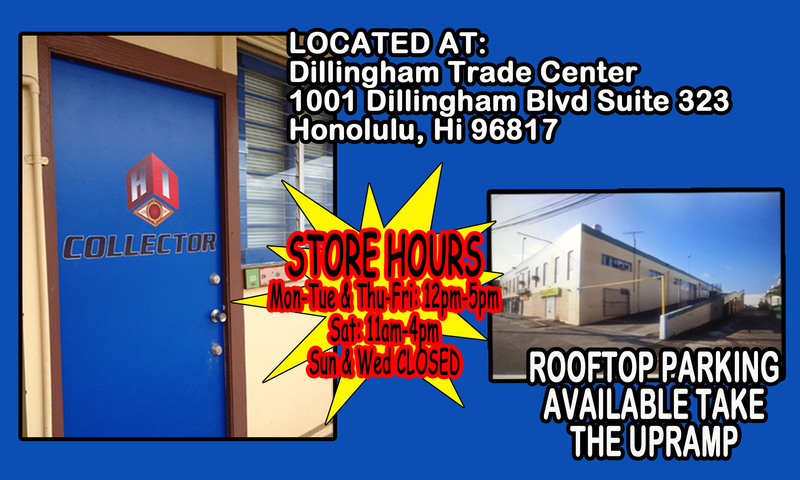 Our physical store address is 1001 Dillingham Blvd, Honolulu, Hi 96817 and is across from the Honolulu Community College. Take the ramp to the free rooftop parking. From there you should see our store.